My church is firmly grounded in the assumption of Christ. And I am wrecked over it. Too many of the sermons could easily be delivered in a Kingdom Hall or a mosque or a synagogue without changing a single word and without offending a single person of another faith. Sermons are encouraging and comforting, emphasizing what we should do. How we should live. Character and discipline are recurring precepts. The pervading concept is consistently service. I can’t remember ever hearing a straightforward caveat that – Christian or not – we are incapable of the doing good and the living right on our own. That character and discipline weren’t enough for Abraham or David, much less for us. I can’t remember ever hearing a frank acknowledgment that there are people in the congregation who don’t know Jesus Christ as their Savior and Lord. I can’t remember ever hearing a clear and complete explanation of why we need Jesus. A firm but loving declarative statement that Jesus is the only way to salvation? I can’t remember ever hearing a personal challenge to face my sin – head on. A firm but loving declarative statement that I need to repent of my sin? I can’t remember ever hearing an impassioned call to repentance – or to Christ. The only time I ever hear a connection between Jesus and the message is when the message is explicitly about Jesus, which again, is extremely rare. I am desperate to hear messages that help me make a connection between the gospel and my everyday life. I’ve done enough reading and studying on my own to understand that the timeless, redemptive story of Jesus can be found in every book of the Bible. I long to hear that story. I long to hear about Jesus. Not only is the assumption of Christ not enough, it is NOTHING. This post is the second in a multi-part series, written mostly in early autumn 2012, published now for the first time. I so agree Julie and hear the hunger in your words. Moving here after being in “Egypt” for so long with the replenishment of faith in my life, has been the “water” I need to quench the thirst I had for so long. 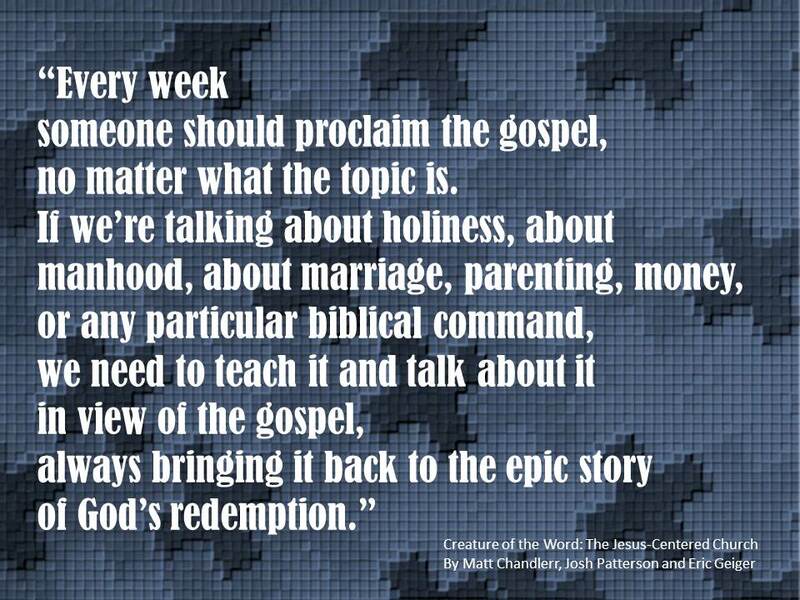 I am still in a methodist church, and I hear most of everything you are saying you need every week. The call to Christ is evident, the repentence of sin for sure, the complete reason we need Jesus I believe so as well. Clear and concise not always. But not everyone fills every need and speaks it as precise and concise as I would like them too, except for our Lord and Saviour…..he fills me up with his words, music fills me a lot with what I need what I don’t hear what I need that week. Especially music that is heartfelt and obviously meaningful. I miss the beautiful solos at church, we don’t have hardly any at my new church, and the church is significantly smaller than ours is in Oviedo, but I think that God knows often times what I need, and He provides that to me one way or another. Egypt was a little rough though. It took it’s toll in many ways. But the benefits were also good for me as well. God knew that. LOL Struggling the way we did when we left, left a longing in my heart that had brought me to today. And that’s a good place and a worshipful and grateful place.